My name is Jonathan Löfgren, 33 years old, and I am an industrial designer living in Göteborg, Sweden. Due to my huge interest in automotive design, I spend a lot of time creating different car concepts. Digital sketching, 3d modeling or just by paper and pen. My current occupation is as an industrial design engineer specialized on high-speed marine seats, cockpit design and all around vehicle design. I started learning Blender about 4-5 months ago and I instantly fell in love with the versatility and competence of the program. I am now able to create design wherever I might be, whenever I feel too. I am otherwise used to software focusing on mechanical engineering such as Solidworks and Pro Engineer/Creo. 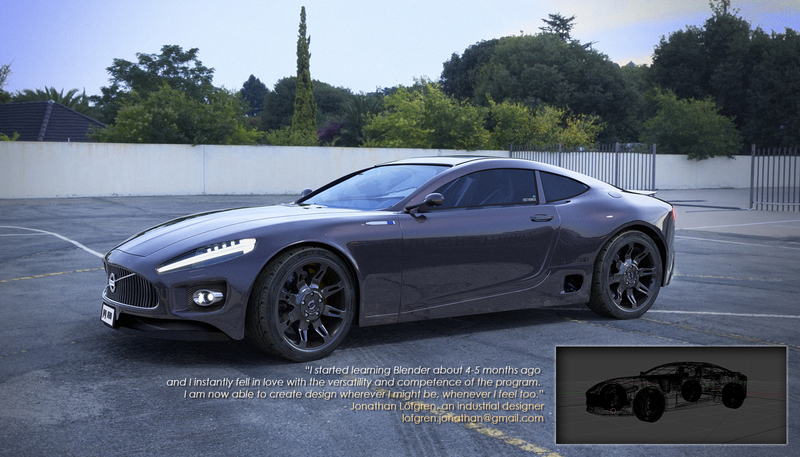 This is a concept car made in Blender. 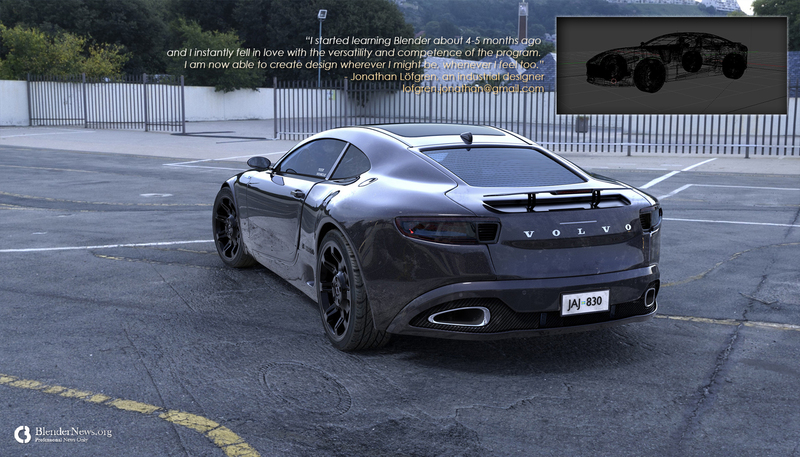 This specific model has a geometry inspired by an Aston Martin DB10 and styling DNA from the current Volvo design with inspiration taken from both Maserati as well as Lotus. The imagined driveline is a 300+ bhp petrol engine working alongside an electric 150+ bhp engine. So the main thought of the concept goes back to the Toyota 86GT. I wanted to visualize a Volvo created for the joy of driving a car. I did not want the tires ultra wide, nor did I want the engine to be a quad turbo 1200 Bhp beast machine. This concept is designed to have a quick but not vicious performance with a focus on driving enthusiasts with a wallet he does not have to be filled with pure gold. That is also why this model was kept a Volvo and not branded as a new "Polestar". The visualizations have been made using HDRI-environment from hdrihaven.com and have textures from poliigon.com.